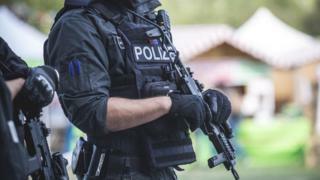 German police are investigating two separate attacks on migrants which have left several injured in the state of Saxony-Anhalt this weekend. Two Afghan teenagers were assaulted by two men on Saturday afternoon in Hasselfelde, reports said. On Friday night, five drunk Germans attacked three Somalis on their way home in Halberstadt, police confirmed. The racially motivated attacks come as national tensions are high over the issue of migrants and crime. More than one million migrants have arrived in Germany as part of Chancellor Angela Merkel’s open-door policy in the wake of Europe’s migrant crisis in 2015. In Saturday’s incident, four Afghans teenagers were at the edge of a sports field when they were verbally abused by two unidentified men, believed to be between 25 and 30 years old. The altercation turned violent and left two 17-year-olds slightly injured. A woman who tried to intervene was pushed against a car by the attackers, but was otherwise unharmed, police said. In Friday’s incident, which took place 30km (19 miles) away, all three migrants were physically injured after being verbally assaulted. A 22-year-old man from the group of five suspected attackers, aged between 22 and 40, also sustained minor injuries, police confirmed. Police say they are investigating for charges of incitement and assault in both cases, but no arrests have been made yet.